Damen designs and builds a wide range of products based on extensive R&D and proven technology. It has particular expertise in workboats designed to undertake the many tasks that come with managing ports and terminals. 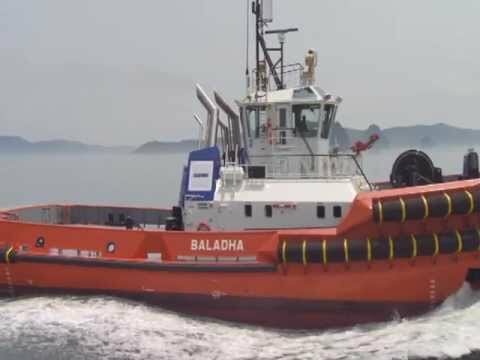 The group is well-known for its diverse range of advanced tugs, with models capable of handling even the largest vessels, but the portfolio also includes pushers, the versatile Multi Cat and Shoalbuster all-purpose workboats, Fire-Fighting vessels, patrol boats, tenders and pilot boats. The group also offers a comprehensive range of craft to serve the Offshore Wind industry that includes fast crew suppliers with the trademark Sea-Axe hull form and specialist, extended-mission maintenance vessels. Damen’s focus on standardisation, modular construction and keeping vessels in stock leads to short delivery times, low total cost of ownership, enhanced resale values and reliable performance. In addition to ship design and shipbuilding, Damen Shiprepair & Conversion has a worldwide network of 15 repair and conversion yards and completes around 1,500 repair and maintenance jobs annually. Other Damen services include spare parts delivery, training and the transfer of shipbuilding skills. The group also offers a variety of marine components such as nozzles, rudders, anchors, anchor chains and steel works. The ASD Tug and its crew make an excellent team, benefiting from the safe working environment that has been created for all onboard. A-ROSA Flussschiff GmbH has commissioned a new ship from the Concordia Damen shipyard in the Netherlands, to be delivered in early 2021. A series of pioneering autonomous operation trials for a Damen Fast Crew Supplier 2610 ‘Twin Axe’ outfitted with collision avoidance technology have taken place in the North Sea. Damen Shipyards Group is proud to announce the recent signing of a contract with Oslo, Norway-based SeaDream Yacht Club. The contract marks a historic moment, being Damen’s first for a cruise ship. SeaDream will operate the 155-metre Mega Yacht on luxury voyages all over the world. On March 4th at Damen Shipyards Singapore, Seaways International took delivery of two Damen Fast Crew Suppliers (FCS) 2206. The Dubai-headquartered company has previously operated a Damen FCS 3307. Seaways International specialises in offshore marine services and will use the new vessels to transport crew to offshore energy locations in West Africa.